"We would very much like to welcome you here for a safari adventure into the hidden wilderness. 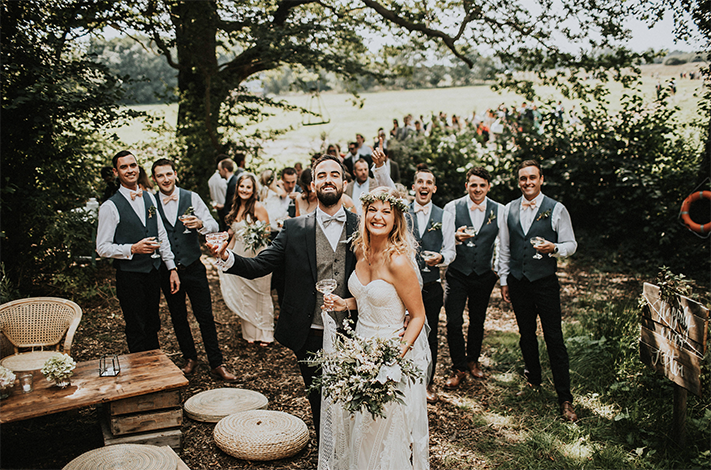 There is so much to see; Unspoilt wilderness, TWO carefully curated ceremony locations on the Wilderness boating lake, the mighty Woodsman's Cabin & Chapel Tent, or the outdoor 'Boat-Zebo,' wild flowers, ferns, oak trees, water meadows, enchanting woodlands, magical Kata tipis, the 'Champagne Shack' Bar, Shepherds Hut, twinkly lights, disco balls, majestic sunsets, awesome views, swings and even a hidden woodland walk back to the Glamping meadow. " The Wilderness is a gorgeous green valley with a lake, ancient woodland and incredible views over the water meadows and beyond. It is a paradise full of wild birds, butterflies, foxgloves, bluebells, ferns, magical oak trees and meadow flowers. 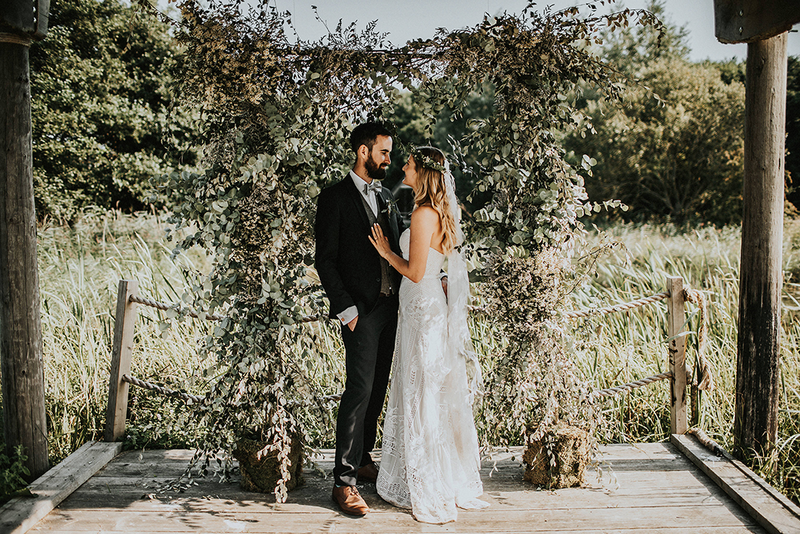 We have two separate licensed areas on site for legally binding Civil Ceremonies and Partnerships, The Woodsman’s Cabin and the Boat-Zebo, both of which sit on the lake. 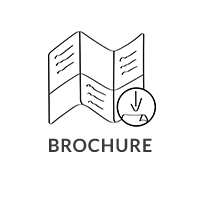 The ‘Boat-Zebo’ is for totally outdoor ceremonies and is formed from a restored vintage, clinker built wooden sailing boat and sits, up-turned and suspended to form a canopy on the waters edge. 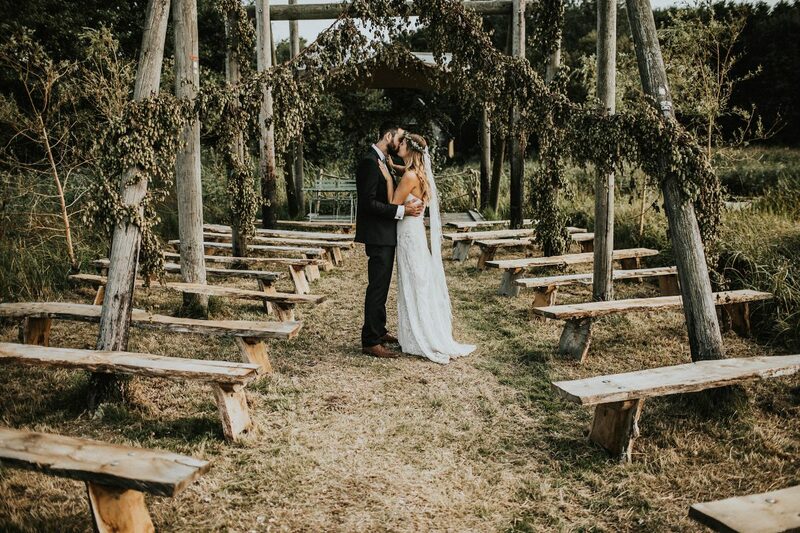 Your guests sit close by, surrounded by tranquil waters, wild flowers and Kentish hops which wind their way up the rustic wooden canopy. Its is completely serene and quiet, with only the sound of the bull rushes and long grasses whistling in the wind and the sweet smell of wild meadow flowers. If the weather is unkind there is no panic, as the Woodsman’s Cabin is a short walk away at the other end of the lake, and can be used for ceremonies. The Woodman’s Cabin, rests slightly elevated to give the bride and groom a view over the water. 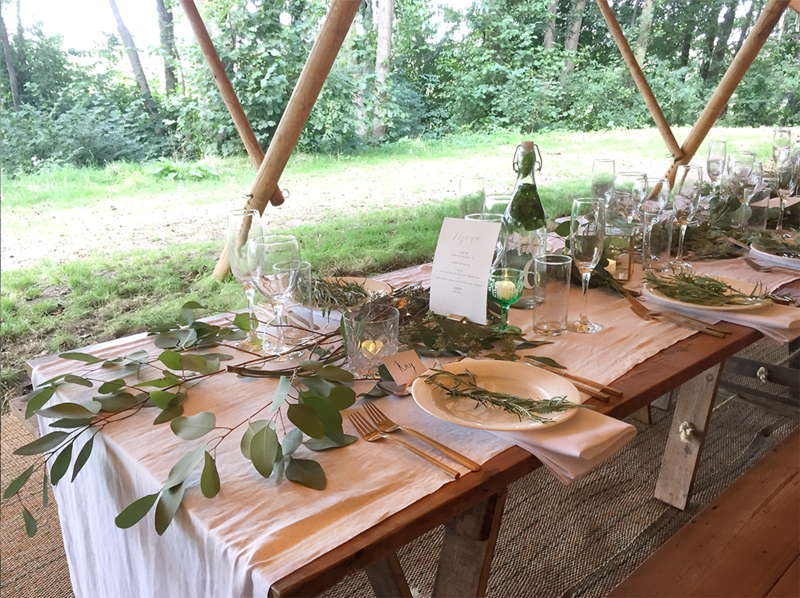 The ‘Chapel Tent’which attaches to the cabin has real bamboo poles and traditional cotton canvas roof and sides, which can be opened up completely to embrace the wilderness which surrounds it. 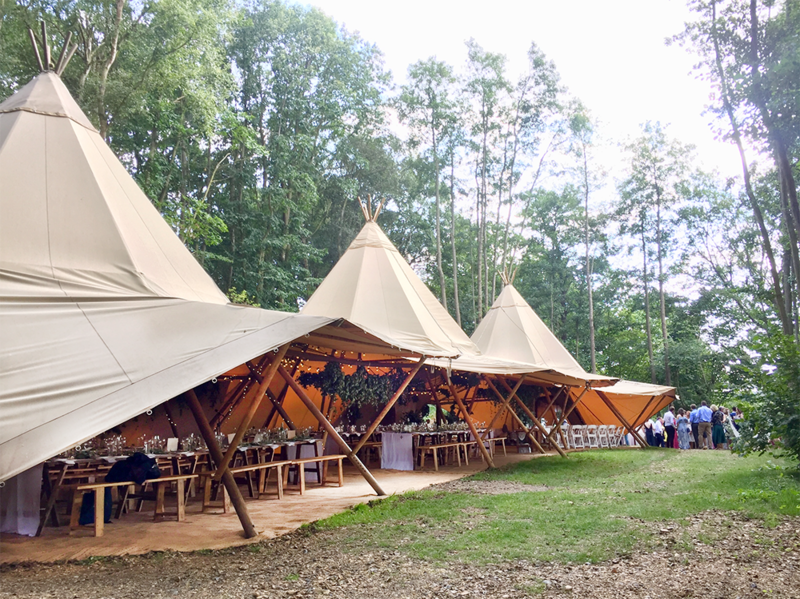 The Woodland Glade is a hop, skip and jump away and includes the unique hand made ‘Champagne Shack’ bar, with swing seats on the verander, chill out area, festoon lighting, a giant disco ball and three large kata tipis. There is a vintage Shepherd’s Hut too, which perches on the hill over looking the valley and is Bride & Groom’s private space for the day. Glamping on site is also available for up to 54 people sharing huge bell and Emperor tents. The Glamping meadow and glade are just a 2-3 minute walk through beautiful woodland. The staff are amazing and the location is just epic. They have enhanced the natural environment and everywhere you look there are cleaver touches. We got married here last year had loved every moment. We all arrived by private which was really fun and everyone commented on how much they enjoyed the journey to venue as it built up the anticipation and gave the guests a chance to bond. When we arrived, it was a bit like arriving at a music festival, we walked through the giant festival entrance gate, and were greeted with acoustic music to serenade us on foot down to the boating lake, and the venue revealed itself in all its glory. As the sun sets it covers the woodland glade in warm golden light - The Champagne Shack provided us with Bramble cocktails and Old Fashions on request, and even let us source our own special craft ales. The team were so helpful and bring or treasured Dog Lottie. We felt so special. Tell us about your experience and wedding day at The Wilderness.